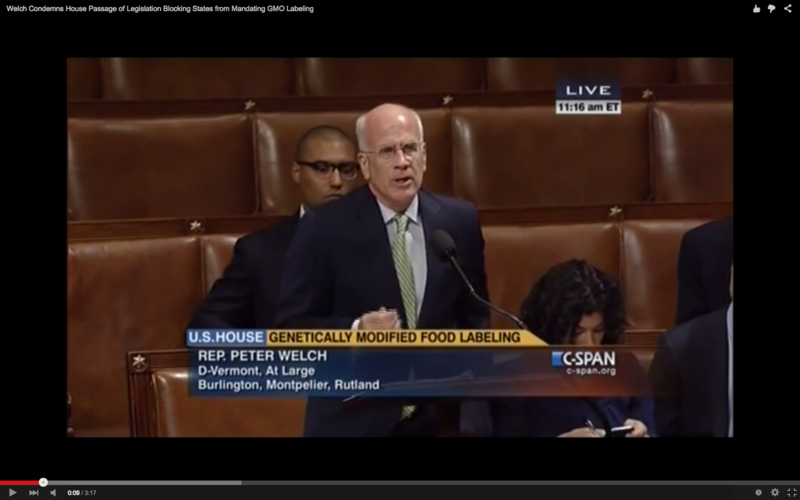 Rep. Peter Welch (D-Vt.) speaks Thursday on the House floor against a bill that would block states from enacting GMO labeling laws. The U.S. House voted by a fairly hefty margin Thursday to block states from doing what Vermont seeks to do: require labeling of genetically modified foods. Does the bill have the legs to make it through the Senate, and would the president sign it into law? That is unclear, but Thursday's vote generated posturing on both sides of the polarized debate. The House vote was 275-150 for the bill, which is backed by GMO seed manufacturer Monsanto. Congressman Peter Welch (D-Vt.) voted against it. “If Monsanto is so proud of its product, then why on Earth is it waging an all-out war to hide it from families who simply want to know what’s in their food? The message to consumers in this bill is very clear: It’s none of your business,” Welch said on the House floor Thursday. A 2014 Vermont law would make the state the first to require labeling of genetically modified foods, starting next July. The Grocery Manufacturers Association, which represents some of the largest food producers in the world, has filed a federal lawsuit seeking to block the law. Gov. Peter Shumlin, who on Sunday welcomed a $100,000 pledge from rocker Neil Young to help Vermont pay its legal bills in the case, on Thursday accused Monsanto of buying influence in Congress. “Monsanto and their corporate food allies have millions of dollars to dedicate to this fight, and today’s vote shows that they are quite skilled in using those vast resources to buy votes in Congress,” Shumlin said in a statement. Shumlin spokesman Scott Coriell said that didn't mean Shumlin was accusing members of Congress of accepting money from Monsanto for their votes. "It means that they are very good at using their significant and vast resources to influence the outcomes of the legislative process in Congress," he said. The Grocery Manufacturers Association applauded Thursday’s House vote in a statement, saying the legislation “protects the consumer from a costly and confusing 50-state patchwork of labeling laws by ensuring that the federal government retains its authority at the top of America's food safety pyramid." David Carle, spokesman for Sen. Patrick Leahy (D-Vt.), predicted there could be interest in legislation in the Senate. Leahy would oppose a bill, he noted. It's also unclear what President Barack Obama would do if a bill reached him. The Associated Press reported that Obama has been silent on the bill, but his administration has voiced interest in voluntary, rather than mandatory, food labeling.